Revival of medieval ‘foundling’ boxes in which abandoned babies were placed send “bad message to society”. 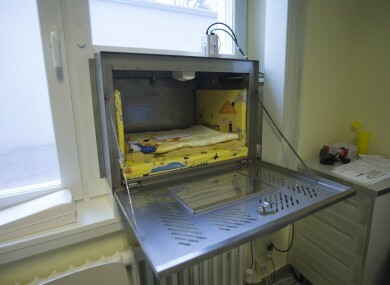 The 'baby hatch' at Waldfriede hospital in Berlin. GERMAN PASTOR GABRIELE Stangl says she will never forget the harrowing confession she heard in 1999. A woman said she had been brutally raped, got pregnant and had a baby. Then she killed it and buried it in the woods near Berlin. Stangl wanted to do something to help women in such desperate situations. So the following year, she convinced Berlin’s Waldfriede Hospital to create the city’s first so-called “baby box.” The box is actually a warm incubator that can be opened from an outside wall of a hospital where a desperate parent can anonymously leave an unwanted infant. A small flap opens into the box, equipped with a motion detector. An alarm goes off in the hospital to alert staff two minutes after a baby is left. Baby boxes are a revival of the medieval “foundling wheels,” where unwanted infants were left in revolving church doors. In recent years, there has been an increase in these contraptions — also called hatches, windows or slots in some countries — and at least 11 European nations now have them, according to United Nations figures. They are technically illegal, but mostly operate in a grey zone as authorities turn a blind eye. Ireland does not have any right now and it seems unlikely that they will be introduced. Health Minister James Reilly has previously said that he believes they would send out “a bad signal in terms of our commitment to the welfare of mothers and children”. They have similarly drawn the attention of human rights advocates who think they are bad for the children and merely avoid dealing with the problems that lead to child abandonment. At a meeting last month, the United Nations Committee on the Rights of the Child said baby boxes should be banned and is pushing that agenda to the European Parliament. There are nearly 100 baby boxes in Germany. Poland and the Czech Republic each have more than 40 while Italy, Lithuania, Russia and Slovakia have about 10 each. There are two in Switzerland, one in Belgium and one being planned in the Netherlands. In the last decade, hundreds of babies have been abandoned this way; it’s estimated one or two infants are typically left at each location every year, though exact figures aren’t available. “They are a bad message for society,” said Maria Herczog, a Hungarian child psychologist on the U.N. committee. “These boxes violate children’s rights and also the rights of parents to get help from the state to raise their families,” she said. She said the practice encourages women to have children without getting medical care. “It’s paradoxical that it’s OK for women to give up their babies by putting them in a box, but if they were to have them in a hospital and walk away, that’s a crime,” Herczog said. She said the committee is now discussing the issue with the European Parliament and is also asking countries which allow the practice to shut them down. Herczog also said it’s wrong to assume only mothers are abandoning these children and that sometimes they may be forced into giving up children they might otherwise have kept. “We have data to show that in some cases it’s pimps, a male relative or someone who’s exploiting the woman,” she said. In some countries — Australia, Canada and Britain — it is illegal to abandon an infant anywhere. Yet, in the US there are “safe haven” laws that allow parents to anonymously give up an infant in a secure place like a hospital or police department. A handful of other countries including Japan and Slovakia have similar provisions. Countries that support this anonymous abandonment method contend they save lives. In a letter responding to UN concerns, more than two dozen Czech politicians said they “strongly disagreed” with the proposed ban. “The primary aim of baby hatches, which (have) already saved hundreds of newborns, is to protect their right to life and protect their human rights,” the letter said. However, limited academic surveys suggest this hasn’t reduced the murder of infants. There are about 30 to 60 infanticides in Germany every year, a number that has been relatively unchanged for years, even after the arrival of baby boxes. That’s similar to the per capita rate in Britain where there is no such option. Across Germany, there is considerable public support for the boxes, particularly after several high-profile cases of infanticide, including the grisly discovery several years ago of the decomposed remains of nine infants stuffed into flower pots in Brandenburg. Officials at several facilities with baby boxes say biological parents sometimes name the infant being abandoned. “The girl is called Sarah,” read one note left with a baby in Lubeck, Germany in 2003. “I have many problems and a life with Sarah is just not possible,” the letter said. Still, Germany’s health ministry is considering other options. “We want to replace the necessity for the baby boxes by implementing a rule to allow women to give birth anonymously that will allow them to give up the child for adoption,” said Christopher Steegmans, a ministry spokesman. Austria, France, and Italy allow women to give birth anonymously and leave the baby in the hospital to be adopted. Germany and Britain sometimes allow this under certain circumstances even though it is technically illegal. Eleven other nations grant women a “concealed delivery” that hides their identities when they give birth to their babies, who are then given up for adoption. But the women are supposed to leave their name and contact information for official records that may be given one day to the children if they request it after age 18. For German couple Andy and Astrid, an abandoned infant in a baby box near the city of Fulda ended their two-year wait to adopt a child nearly a decade ago. “We were told about him on a Sunday and then visited him the next day in the hospital,” said Astrid, a 37-year-old teacher, who along with her husband, agreed to talk with The Associated Press if their last names were not used to protect the identity of their child. The couple quietly snapped a few photos of the baby boy they later named Jan. He weighed just over 7 pounds when he was placed in the baby box, wrapped in two small towels. When Jan started asking questions about where he came from around age 2, his parents explained another woman had given birth to him. They showed him the photos taken at the hospital, introduced him to the nurses there and showed him the baby box where he had been left. Earlier this year, the couple began the procedure to adopt a second child, a boy whose mother gave birth anonymously so she could give him up for adoption. Astrid said Jan, now 8, loves football, tractors and anything to do with the farming that he sees daily in their rural community. She said it’s not so important for her and her husband to know who his biological parents are. Email “‘Baby boxes’: what they are, and why the UN wants them banned”. Feedback on “‘Baby boxes’: what they are, and why the UN wants them banned”.